Historians have been struggling for decades to define public history. I tend to do so loosely, as anything professionally-trained scholars do to advance and incite historical thinking among the interested public. It is fundamentally about engaging with non-academics in meaningful and reciprocal ways to create and disseminate knowledge about the past and its applicability to the present and our collective future. 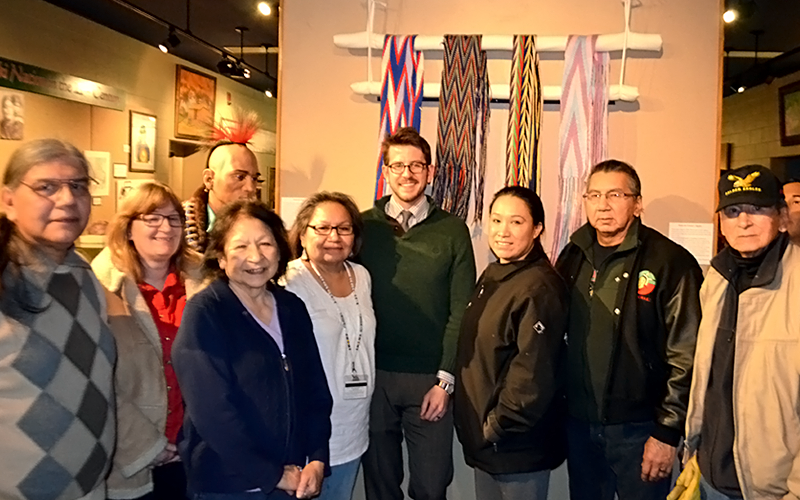 Eric with friends from the Meskwaki Tribal Museum after a public lecture in 2015. For me, public history exists along a spectrum. On one end are the professional museum exhibits, digital history projects, and policy papers to which historians lend their expertise and consultation. These often require the same rigor of thought, method, and composition as any academic article or book, and represent the formal extreme of what public historians do. They belong on a CV and scholars should get professional credit for doing them. On the other end of the spectrum, however, are less formal activities like volunteering at the local National History Day competition, giving public lectures to community groups and K-12 students, or penning historically-informed opinion pieces in the local newspaper. A couple of years ago I ran a marathon and raised almost $4,000 for my friends at the Center for American Indian Research and Native Studies on the Pine Ridge Reservation. Would I place that on my CV? Of course not. But I believe in CAIRNS and the critical thought they promote, so I dedicated my time and energy as an able-bodied human who happens to care about the past to them. And in some small way, that promoted public history. I have, however, helped CAIRNS with research, writing, and planning for a number of more traditional public history-oriented projects, like the white paper-style report we did on the history the (former) “Harney Peak” in South Dakota or a major exhibit exploring the causes of the 1890 massacre at Wounded Knee. I’ve also donated more than 10,000 documents to the Meskwaki Historic Preservation Department, which I photographed during my dissertation research. The stories I tell belong to real people and real communities, and as a publicly-minded historian, I’m constantly looking for ways to inspire interest in local and history. And the statistics are in: nearly a quarter of recent history PhDs work outside the traditional career paths for their profession–teaching at a college or university. Indeed, a recent report by the American Historical Association shows that newly minted historians who graduated between 1998 and 2009 pursue careers in everything from academic administration to local, state, and federal government. Others work in private consulting firms, museums, libraries, archives, and in myriad other venues. At the same time, for many in graduate schools or the professoriate, burgeoning interest in publicly engaged scholarship has made it difficult to delineate the line between “public” and “academic” history, as research projects employing the tools of digital, oral, and exhibit-based interpretation frequently crisscross these categories. As a self-described public historian, I too straddle these worlds. But I do not see my “academic” and “public” portfolios and experiences as divorced from one another. Accordingly, I try to marry my scholarly and public selves in every project I approach.